The new and improved kids’ department expands to all doors as the chain ups its one-stop shopping game. Bigger, broader, deeper: the DSW kids’ department aims for destination status. DSW (Designer Shoe Warehouse) already owns plenty of women shoppers, especially those just starting out in their careers and who have a need as well as the disposable income to do lots of (affordable) shoe shopping. However, it’s when many of these customers get married, start having kids and are juggling work and parenting responsibilities that DSW execs noticed a drift away from them being regulars. DSW research discovered that many of these women just didn’t have the time to indulge in shopping for themselves, opting instead for outlets where the whole family could get their shoe needs fulfilled. From sneakers and sandals to boots, casual, dress and uniform styles in stores and thousands more styles online in sizes spanning infant, toddler and youth, Persson says DSW aims to be a back-to-school destination for families as well as year-round. “We aren’t just an athletic or casual house; we meet all the needs in the children’s wardrobe,” he says. “It’s a wide assortment of quality brands from designer to traditional athletic.” Key brands include Nike, Adidas, New Balance and Vans as well as dressier labels like Sperry, Steve Madden, Stride Rite, Minnetonka, Carter’s, Robeez and Kenneth Cole. The assortment also includes DSW private label brands, Max + Jake and Olive & Edie, which Persson reports are performing exceptionally well. “Our consumers view them as regular brands,” he says. In addition to a huge assortment, Persson says DSW is going the full nine yards on proper fitting. All department staff have received extensive training and passed the chain’s fit certification program. They are identified in stores by sporting kids’ fit expert buttons. “We’ve walked them through the Brannock device, instructed on how to ask probing fit-related questions and explain why, for example, a child might need a greater width versus a narrow or a basic size,” he says, noting parents want what’s best for their children. The fact is plenty of parents may know how to fit themselves, but not so when it comes to their kids. Do you leave a thumb’s print worth of room? Should the toe go all the way to front? What’s the best shoe for safety purposes? 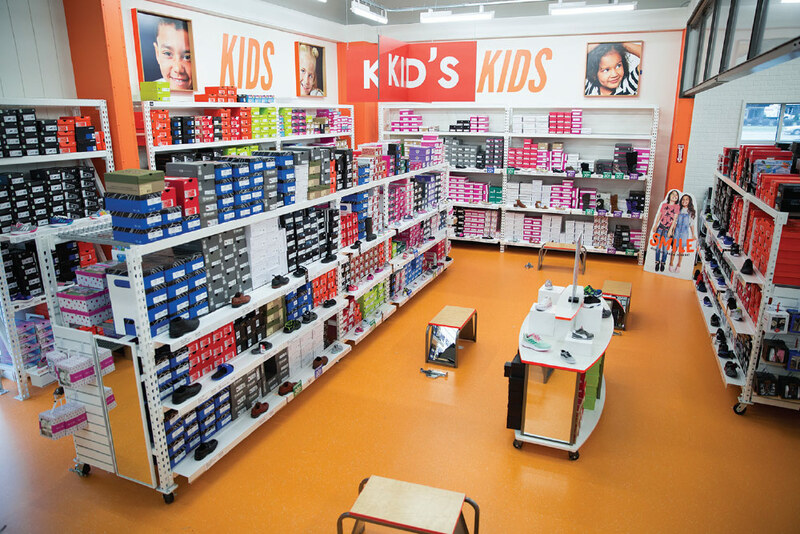 “The expert service gives Mom confidence, especially first-time ones who are looking for a safe environment to shop for children’s shoes,” Persson says. The fit expertise marks a new level of service at DSW, which Persson says is a must when it comes to kids. “For Mom to think of us as a kids’ resource, we needed to go a step above,” he says. “We didn’t want her to have to hunt for her kids’ shoes on her own. This added level of service is designed to gain her confidence, just like we have when it comes to her purchases.” And while Persson says DSW falls short of being a 100 percent sit-and-fit experience, the fact that it is willing to measure every child’s foot as well as ask relevant questions provides assurance to parents that the DSW is listening to their child’s needs. What’s more, when compared to many competing retailers who have stripped away service, the willingness to engage customers represents a fresh approach, according to Persson. And if Mom wants a little space, he says, she can grab her kid’s size and go. 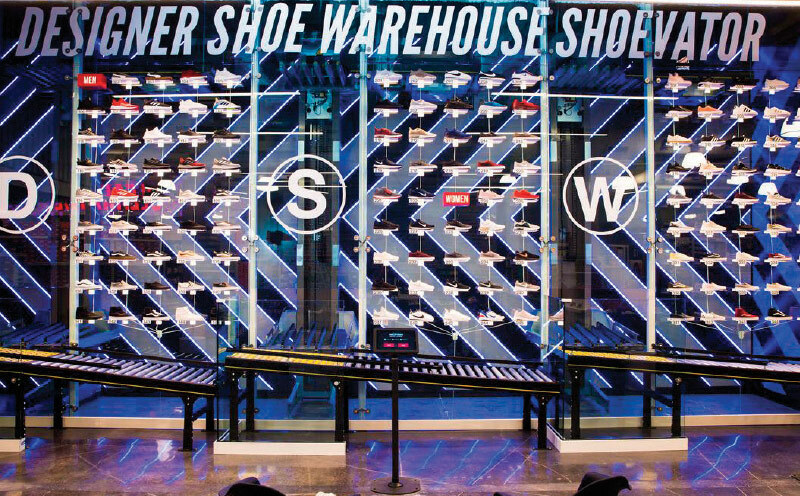 The DSW Shoevator is like a giant shoe vending machine. A smaller-sized format bets big on experiential draws. Housed in the Showcase Mall on The Strip in Las Vegas, the new DSW store that opened last month might be half the size of one of its typical outlets, but the experience is over-the-top, Sin City-like. It all starts at the “video tunnel,” where customers are drawn from The Strip into the store through a three-sided sensory passageway that gives the feel of being inside the visual display. “Our video tunnel is an immersive and exciting feature that makes customers feel as if they’re flying over a city, swimming under water and walking through a desert,” states Roger Rawlins, CEO. Once down the escalator and onto the sales floor, visitors are met with a bevy of shopping entertainment experiences led by the one-of-a-kind Shoevator. The device consists of three elevator lifts, serviced from a mezzanine over the sales floor. Customers order shoes from the wall via the DSW app or a tablet located at a nearby kiosk, which alerts an associate on the mezzanine. The associate receives the order, picks the ordered shoes and sends it to the sales floor in a numbered bin via the Shoevator where the customer picks it up. “It’s essentially a giant shoe vending machine,” Rawlins says. Customers can also win a pair of special kicks by playing the Heat Vault Keymaster machine. Reminiscent of an arcade classic, Heat Vault Keymaster challenges players to retrieve sneaker swag in just two moves by inserting a key into a keyhole using a joystick.